They say that you can find almost anything on Second Life. For nearly eight years, I’ve enjoyed midnight exploration through haunted houses, sim-wide forests and gardens, art installations and international sites. 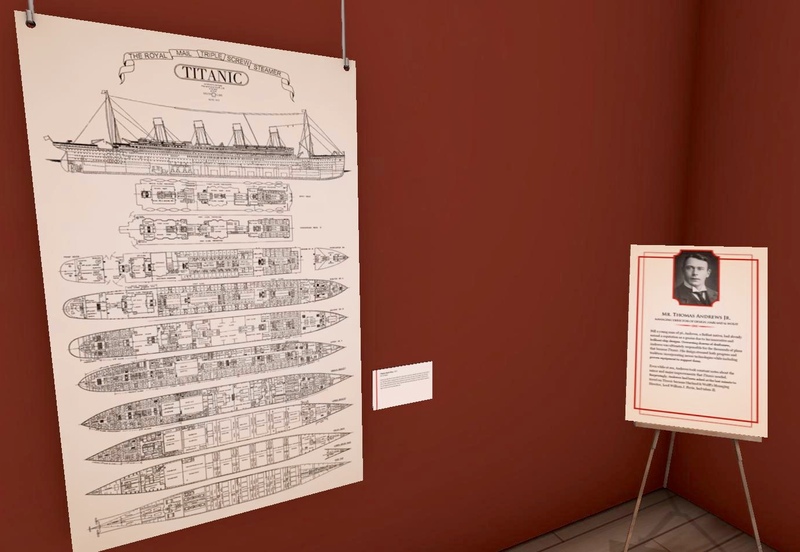 I was thrilled to see a new exhibit which focuses on the Titanic mainly because I’m going to write about this tragic tale in a manuscript I’ve been working on. 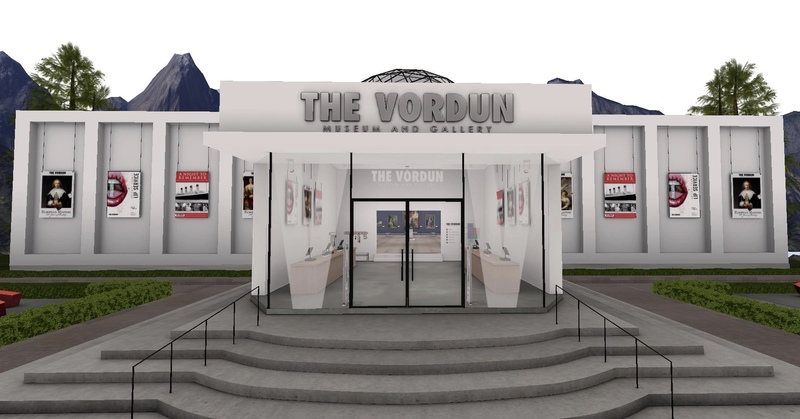 I learned about The Vordun Museum and Gallery (Fancy Decor (78, 98, 31) through the editor’s picks in the destination guide. Curiosity led me to Emery Milieux’s exhibit and I wasn’t disappointed. An interactive approach is a wonderful way to educate SL residents. Everything about the installation was well thought out and realistic. Emery installed the theme title very creatively. Not only does the gold and black lettering appear dimensional, the wall has a water-rippling effect that makes it seem as if the title is floating upon the sea. How clever to set up pier posts with rope in front of it. 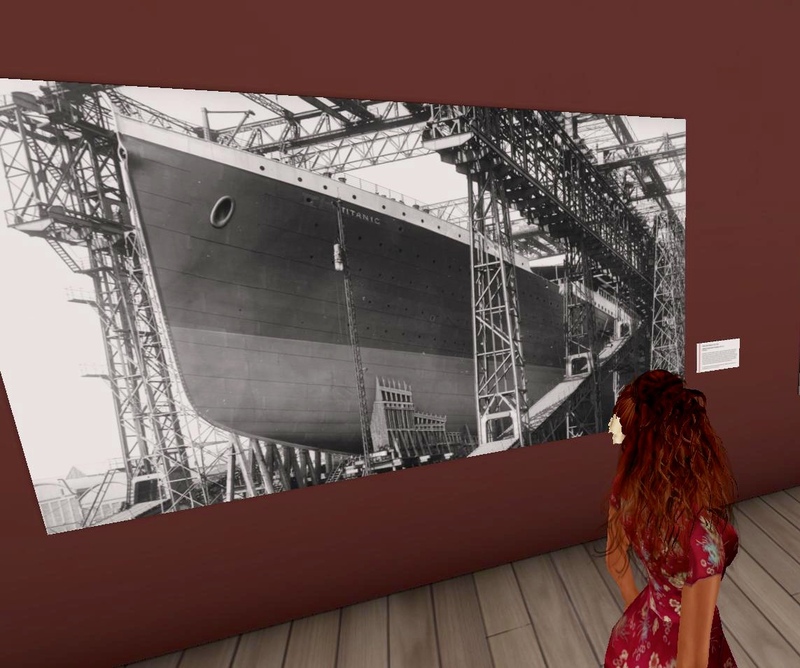 Its partner information wall informs visitors about the RMS Titanic’s maiden voyage, how it sailed out of Southhampton, England with its destination New York City. That it was one of the largest and luxurious passenger liners at the time. Footnote: the Titanic was part of The White Star Line’s Olympic-class ocean liners. She stood tall, huge, impressive and beautiful among with RMS Olympic and HMHS Britannic. With speed in traveling to America the luring factor for the wealthy high society, the Titanic was also built with comfort and speed as a priority. 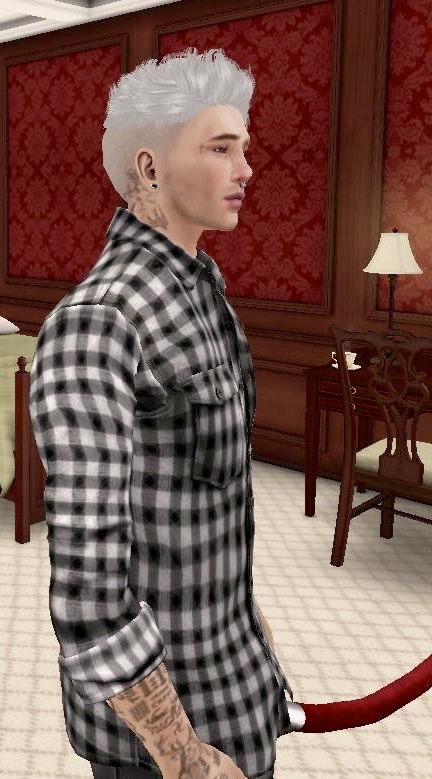 I spoke with Emery in the central area of The Vordun Museum. 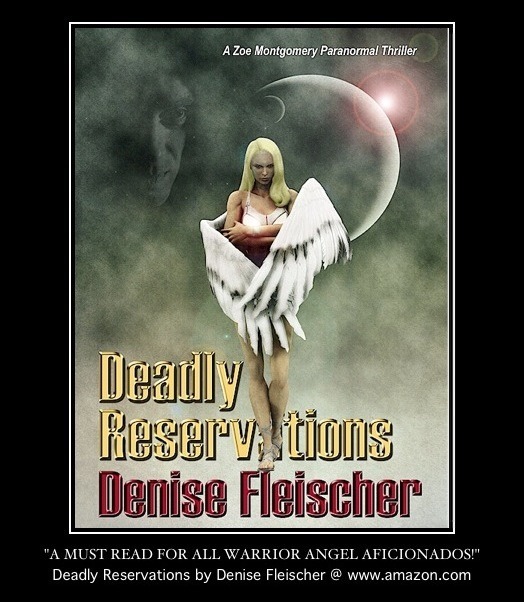 It seemed every minute someone teleportated to the landing site to see the exhibit. I was quite impressed. According to Emery, the museum had only been installed three days before our interview on July 16. He could only take credit for “A Night To Remember” wing. I asked him if this was his first exhibit or had he created others in the past? He started the project by constructing the shell of the exhibit, a model of the ship, cabin recreations and numerous graphic design work. He watched a handful of documentaries and spent hours researching the story further on the Internet. I asked him about his research and we briefly discussed a book I’m reading to help me better understand the last hours of the Titanic for my own novel’s research. I’m currently reading “Voyagers of the Titanic – passengers, sailors, shipbuilders, aristocrats, and the worlds they came from” by Richard Davenport-Hines. We also touched upon, “Titanic’s Final Mystery,” which was a research-based documentary retracing Titanic’s maiden voyage and the natural occurrences and human misunderstanding that led to her final hours. 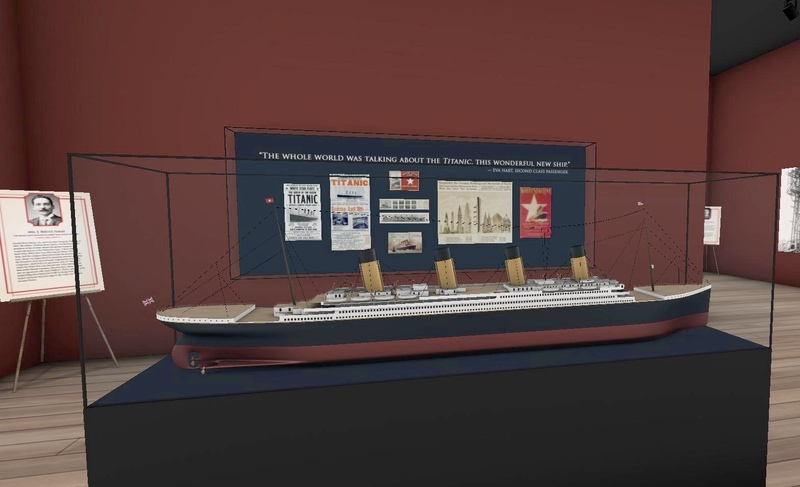 Emery said it took him about ten weeks, four or five of which were spent just modeling the ship, to complete all the elements of the exhibit. He stated that he had assistance throughout the project. Asked if other museums have expressed interest in presenting the exhibit, he replied that it’s too new. But he is open to keeping it alive and moving it around, if it were a right fit. In regards to his other interests, Emery has a discussion group at Common Grounds. Things have slowed down there, for sure, but it’s still alive and well, he said. 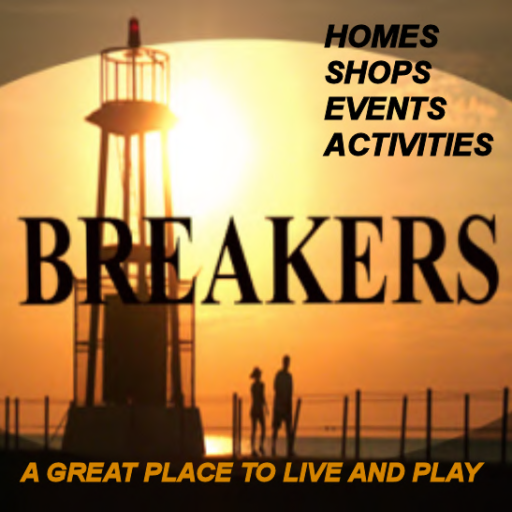 His focus has pivoted more towards his store and event production. Upon entering the south wing, you see the Titanic Deck Plan, 1911, an ink and pen representation. If you click the card on the side of the poster the ship’s measurements will pop up in your local box. Titanic in the shipping yard in Southhampton. Having the actual individuals responsible for Titanic’s operation stationed in the exhibit was an experience in itself. Emery created this model of the Titanic. What a great job he did recreating it. Two pictures depicting the social classes on the deck of the Titanic. Though their financial situations were extremely different, they all hoped for a better life in America. An example of the immigrants’ cabins shows cramped quarters with barely any amenities. Here you see the spacious cabin of first-class passengers, elegant wallpaper, better lighting, a place to sleep, read, write letters and have tea. Looking out at the starry night just as the passengers of the Titanic would have. Emery’s example of class separation was not only observed through the cabin styles and accommodations, but also in material wealth. Poster on easel informing visitors about Emery. Emery on the grand staircase. A poster detailing the mild winter of 1912 which was responsible for a large number of ice to have broken loose from the arctic regions. It mentions that the Titanic received five different ice warnings. Because of the numerous passenger messages, he had to send to Cape Race, Newfoundland, the wireless operator had received a sixth ice warning, but put the message under a paperweight. Captain Smith never received it. Frederick Fleet, Titanic lookout beside a representation of an iceberg. At 11:40 PM an iceberg was spotted dead ahead. The speed the ship was traveling and its size made it impossible to avoid striking the iceberg. Its sharp edge cut through the side of the ship in a mere 37 seconds, the damage was done. The wreckage of the Titanic in photographs and artifacts in display cases. In the last gallery, a newsboy announces the great loss at sea. Emery mentions that the 20 lifeboats the Titanic had could only carry about 1,178 people. There were over 2,200 aboard and only 18 lifeboats were used, many filled to half capacity. On the right wall, Emery has lists of first, second and third class passengers and crew. Those saved and lost are mentioned. The third class and the crew had the greatest amount of losses. Third class passengers: 173 saved and 535 lost. Crew: 216 saved and 700 lost. Pictures of those aboard the Titanic cover the back wall. Numerous times I found myself drawn to this exhibit. Do not miss it!